It is great to be receiving some much needed rain at the time of writing. Fishing the deeper holes in the Tweed this week using Ecogear ZX40’s and Atomic soft vibes has produced some flatties, school jew and queenfish. Remember to carefully sound around the chosen holes and find the bait schools holding close to the bottom before fishing the vibe lures. Flathead do not show on the sounder as they are partly submerged into the sand or mud bottom in the deep holes. Once bait is found they will usually be holding underneath and waiting in ambush. An interesting week with some unique species caught including Golden and Diamond Trevally. As Smithy mentioned more rain has arrived courtesy of Cyclone Trevor, great to see that inland areas that previously missed out are getting it this time. We are getting late in jack season and the bigger ones could be pushed downstream by the fresh. While it’s still warm there still a good chance of catching them in the next month, the seaway is a good place to try. 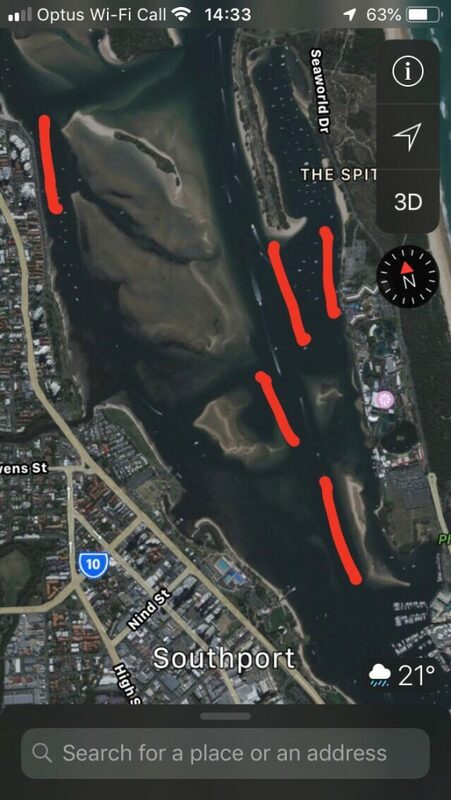 The mulloway will love the dirty water too. 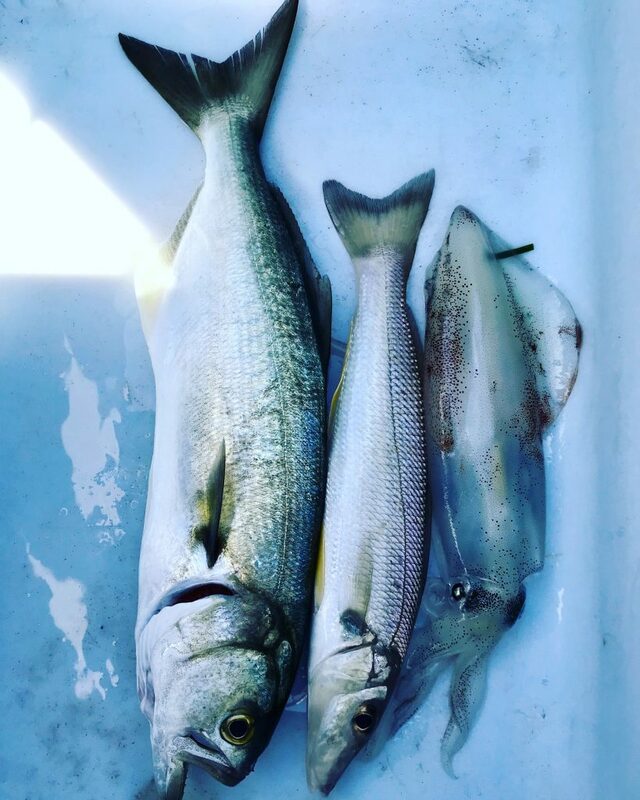 I’ll be doing some heavier tackle charters in the seaway targeting jacks, mulloway, kingfish, trevally, flathead and anything that turns up. 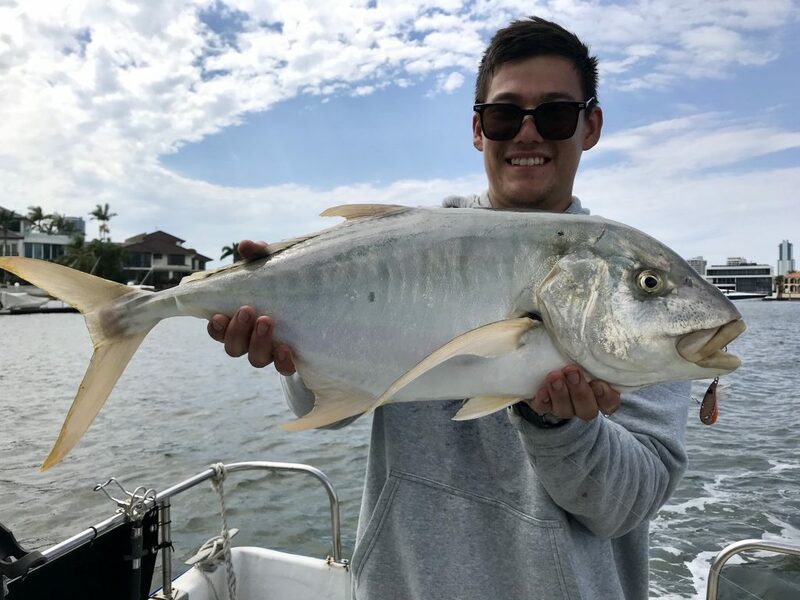 Let me know if you’re keen to book a seaway charter and we’ll find a day with the right tides and conditions then catch live whiting, squid, and possibly tailor first on lures in the broadwater. Locals Mark, Zen, and Kai came fishing and we caught a big variety of fish plus squid, cuttlefish and even an octopus on the Ecogear ZX40 blades and Zerek fishtraps. 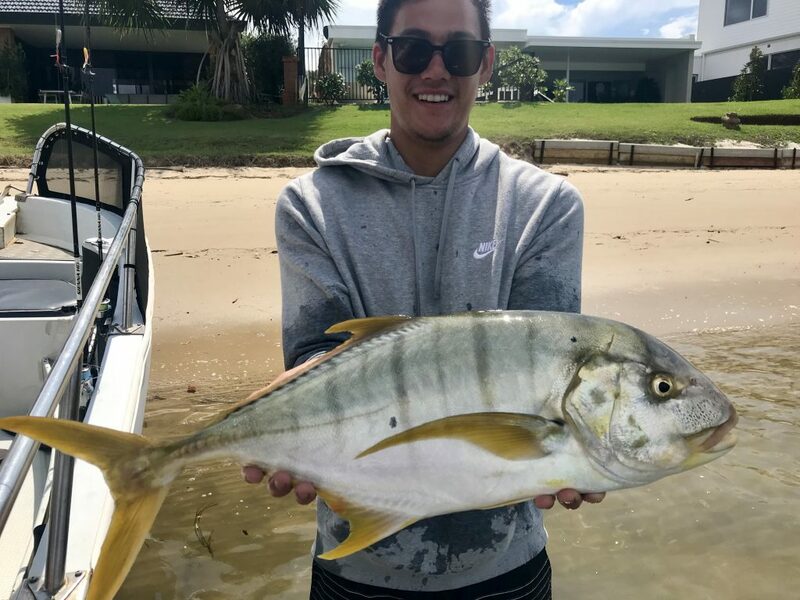 The highlight the day was a 68cm Golden Trevally caught near Cronin island, on 6 lb (2.7kg) line and a pink Ecogear ZX40 lure coated in Sax scent goldprawn. What an effort it was by Kai, showing great patience and concentration in a 25 minute fight. This stunning fish would have weighed close to 5kg, a trophy fish on the light gear! 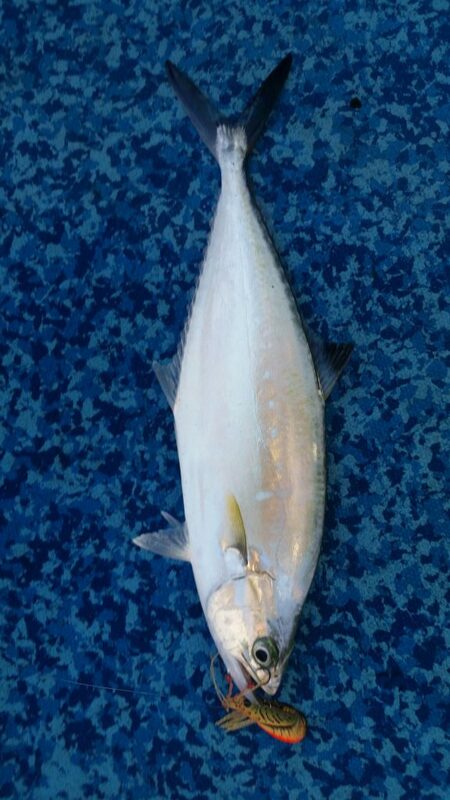 His brother Zen also caught a smaller Golden Trevally, and dad Mark is now a lure convert. There has been a lot of Tailor around in 6m depth opposite Seaworld. 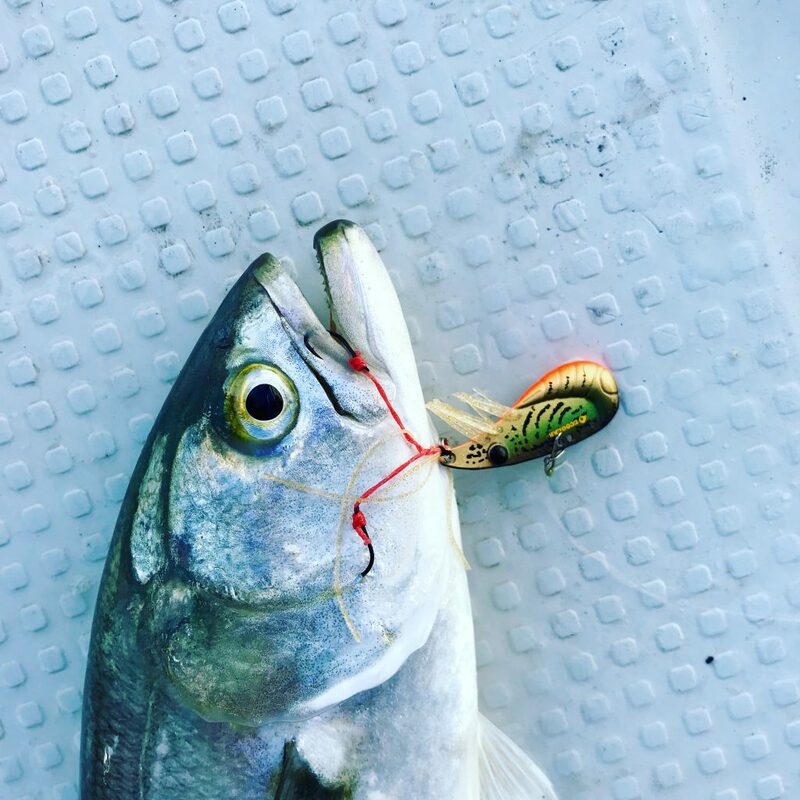 It’s a good idea to always carry a rod set up with a small slug on your boat, in readiness for tailor, trevally or queenfish busting up. Look for birds diving and feeding. They go mad over the Ecogear blades, as do the tailor, queenfish, pike, squid and many others. 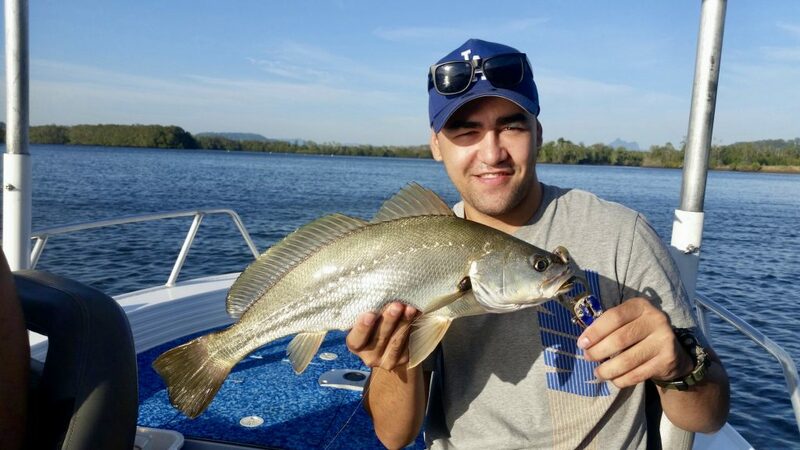 This rain is slightly disrupting our busy week of charters, but it is essential if we are to experience some excellent fishing over the cooler months for flathead, big bream, mulloway, snapper, flounder, squid, and bigger winter whiting. 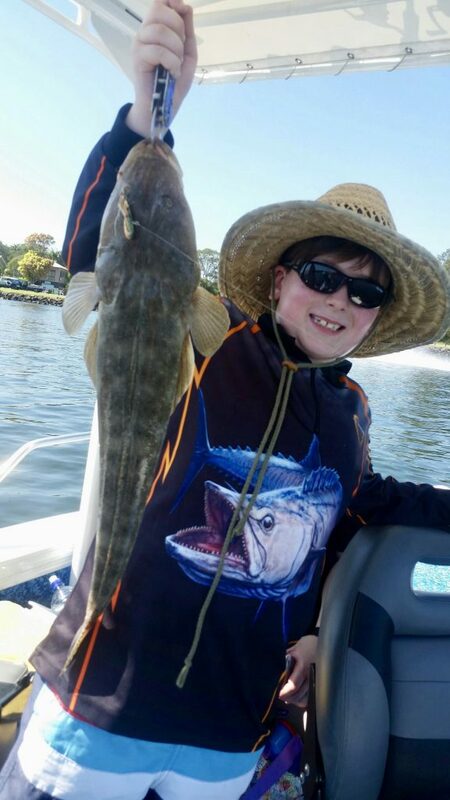 To book your private charter guaranteed to catch fish on lures contact Smithy on 0419 028 704.